I lived in Copeland Place for many years it was my parents house i sold up in 1991 and moved nearby, always wonderd why there was a dead end to Copeland Place. I once spoke a nieghbour that told me that there were teraced houses right through towards Clynder St and beyond and opposite my house where the tenements are now. Does anyone have any info on this,,, ive been meaning to post this up for a while now and till a few nights ago i had a dream about this dead end wall that prompted me to post this up. I hope that all you wonderfuly informed Hg'ers can crack this mystery for me. I would doubt that Copland Place ever crossed Clynder St. In 1892, Copland Place (or Osborne Place is it was then) was a dead end as was Brighton Place and Woodville Place. When someone opened up Clynder St for housing they clearly extended both Brighton Place and Woodville Place into Brighton and Woodville Streets. My guess is that Columba Street would have been more in line with Copland Place had it been extended. As it is, Columba Street is offset a fair wee bit . My guess is they extended the other two 'Places' but left Osborne (later Copland) as it was, making it a dead end. Funnily enough, just had a look at the 1912 map, Copland Place definitely doesn't extend Clynder St but that map shows it as meeting Clynder St rather than a dead end. That would mean they plugged that row of tenements at a later date which sounds dodgy. My hunch is that the 1912 map is slightly wrong in not showing it as a dead end. Thanks for that info Schiehallion, the nieghbour that told me the info was a senior in his 80s @ the time so maybe he was mistaken, but the way he was discribing the area felt it was real. He had also indicated that the tenements facing the Copeland pl teraces were also teraced housing facing north towards summertown road. Would the tenements on Copeland pl also be built the same time as the ones on Clynder street? they seem to be of the same sandstone style and era. You can see from the 1892 map that Clynder St hasn't been started...yet The tenements on that map appear to be the same ones today when compared with live maps, as are the stand alone houses on the south side of Copland Place (Osborne Place). The back courts of those Copland Place tenements when viewed in live maps exactly match the ordnance survey drawing from 1892. There are markings on the map following the route of Clynder St so possibly work was due to start soon? 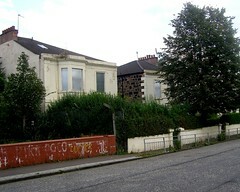 The Govan Free Church shows the beginnings of Clynder St down its' western side. That church is gone today leaving a modern block of flats at the junction of Clynder St and Summertown Road. Mori wrote: I lived in Copeland Place for many years it was my parents house i sold up in 1991 and moved nearby, always wonderd why there was a dead end to Copeland Place. It can't be Georgian if it was built in the 1880s. yer right OYT wikipedia is saying this. Georgian architecture is the name given in most English-speaking countries to the set of architectural styles current between 1720 and 1840. It is eponymous for the British monarchs George I-IV, who reigned in continuous succession from August 1714 to June 1830. I'm sure it said Georgian teraced house on the deeds when i sold the house, then again maybe i'm getting my dates mixed up. I doubt it'd have said 'Georgian' on the deeds. It's maybe more likely the estate agent's bumf said Georgian. There's also the question of style. St VIncent Crescent is often described as and definitely 'looks' Georgian even though it's undoubtedly Victorian. I was fascinated by those houses from the first time I saw them, couldn't believe there could be such lovely terraces (with the ones in Copland Road and Ibrox Terrace as well) decaying away in the middle of the crud that is Ibrox today. After a bit I worked out that (of course) the nice bits got there first, then the docks/industry/nasty council flats came swirling up round them. How astonishing that you lived there - what are the houses like inside? Are they as huge as they look? I've been trawling through the Mitchell's Post Office Directories (the complete and utter history of Walmer Crescent), was there yesterday digging out a bit more, so had a quick look for Osborne Place. Rather thwarted by it being listed under Govan in the suburban appendix, which only has residents by surname, instead of a street-by-street listing (which is odd in itself - Walmer Crescent, also in Govan at that time, IS in the street list, luckily for me). So I had a look at the census indexes - Osborne Place appears in the index for 1861 and later censuses, but not in the 1851 index. Wikipedia has it that Osborne House (Queen Vic's Isle of Wight holiday home) was bought in 1845 and pulled down and rebuilt from 1845 to 1851 - so a likely name for streets laid out in the 1850s? Sunflower wrote: Can't remember when Prince's Dock was built, but it was after the 1850s, maybe 1870s? A bit later than this - constructed between 1893 and 1897. It was originally called Cessnock Dock. There was a large villa [called Cessnock House I think] on the site of what became the canting basin. It was demolished to make way for the dock. Whitefield, Moorpark, Ibroxhill, Bellahouston, Middleton & Plantation. I might even have missed one or two. Whatever, none of them survive. yes i lived there for 24 years my parents brought me up there and when they passed on i inherited the house and spent the best years of my life in that area, but laterly the area went down with the tenemented council flats accross the rd becoming occupied by drug addicts and the undesirables is when me and my wife sold the house to bring up our family elsewhere. The houses were all decorated internaly individualy different from the next with every cornice and ornate feature to the highest standards, the cielings were around 16' high and every room had its own individual ornamental fireplace. plaster paper was used in all the rooms with designs of the highest standard, 3" thick floobords and charcoal deafning in between them for soundproofing, i discoved all these features while we done a major renovation of the house during the early 80s, the house was built to a very high specification with the best of wood and plaster materials used of that era. There were 4 bedrooms upstairs and a very large attic ( very spacious ) large sitting room ,study, kitchen and dinning room and then an additional room added on from the early 20th century i think that was used by most of the owners as the kitchen. The front and back gardens were very generous with some very mature trees and planting that had went wild over the decades, there was a brick built shed in our back garden as well which none of the other houses had which made my house differnt as well, and then we had a lane that ran in between all the houses that was maybe used as a service lane for deliveries and servants entrances i imagine. I took a wee trip down there a while back to look at my old house, the garden had overgrown and the the state of the house was in need of repair and repainted... made me feel sad . This one is quite close to home for me as I live in the old flats on Summertown Road. These date from 1878 so I think would predate Clynder Street by a good wee while, although mine is of different type to the tenements on Copland Road/Place. The terraces are in an amazing variation of repair. Some are very well kept, others wholly derelict. The one on the corner of Brighton Place has recently been refurbished and an application for multiple occupancy has been made. I used to work with a guy who grew up in the terraces and he told me an interesting tale. His families problems started when they installed a new boiler. Straight away the house was infested with cockroaches and the only way to get rid of them was to turn the heating off! They couldn't solve the problem and ended up selling up and moving on. Not sure what era this was although he said the Stadium Bar was being built at the time. Since the St Saviours chapel was demolished I get a fantastic view of the Merryland Street villas and these buildings are really the jewel in the crown of this area. If I was more computer-minded I might start a project on them myself. Interesting times ahead for the area. Look forward to your future postings. PS: you can tell your pal on SSC that none of the houses on Carmichael/Woodville St/Copland/Summertown Rd are boarded up, despite the unsavoury residents. I'd tell him myself but don't think I could join a forum with adverts for built-up shoes. Now, now, it's bad form to carry arguments between fora. Do you mean specific houses, though? These ones on Woodville St look pretty boarded up to me. I was actually referring to the square of council tenements bounded on Carmichael Street by the 24-hour burger van. Not the terraces. You wonder if those houses in your photo will ever be economical to renovate. Clouston Street in the west end reminds me of what these houses could look like in some parallel universe. Anyway back on topic, I have some vague memory of seeing a streetplan of this area which showed part of the terrace as a school at one time(somewhere between Copland & Brighton Places). Anyone able to confirm or just a figment of my imagination? Josef wrote: Do you mean specific houses, though? These ones on Woodville St look pretty boarded up to me. Both these houses have in fact been renovated at some time in the past, at which point they were split into upper and lower flats. However the house on the left has been unoccupied for as long as I can remember. As for the house on the right, the upper flat had somebody living in it until fairly recently. The lower flat was the scene of an extremely brutal and squalid murder in 2001 and has been unoccupied ever since. See here. Who would want to live there after something like that?